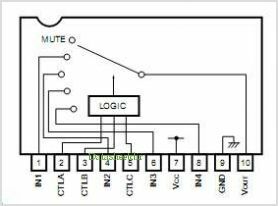 The BA7644AN is a four-channel Analog multiplexer with mute, designed for use in Video cassette recorders. It fea- tures a wide dynamic range, and wide operating frequency range, and is suitable for switching Audio and Video sig- nals. By ROHM Co. Ltd. This is one package pinout of BA7644AN,If you need more pinouts please download BA7644AN's pdf datasheet. BA7644AN circuits will be updated soon..., now you can download the pdf datasheet to check the circuits!